This book is on my short list of “must reads” for anyone interested in Mongolia. It’s not simply a history of the Mongols and their empire, but what they did that still influences us today in ways that you might find quite surprising. Weatherford effectively demonstrates how the way of life dictated by the vicissitudes of living on the steppes of Central Asia formed Mongol society and, indeed, Genghis (hereinafter called by the more accurate rendition, “Chinggis”) Khan himself. 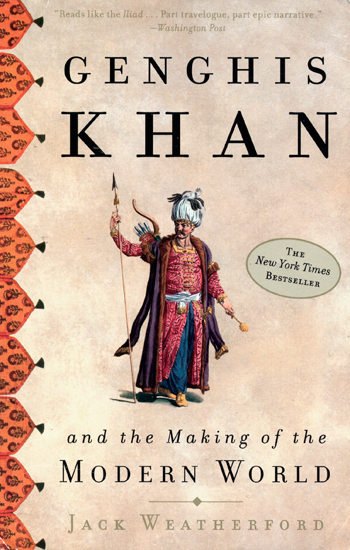 After reading “Genghis Khan and the Making of the Modern World”, I was left almost wishing that the Mongols had been able to keep going to the Atlantic and beyond. So much of what people know about them was, unusually, written by the “losers”, historians and chroniclers in the countries that the Mongols conquered. Not surprisingly, the emphasis is often on the destruction and disruption that they caused wherever their armies appeared. The only surviving source of information on Mongol history by the Mongols themselves that is available in English is “The Secret History of the Mongols”, a book that will deserve its own post once I’ve acquired the latest translation, which, with luck, will be this summer. Chinggis Khan was not a man to take “no” for an answer and he and his sons and grandsons had the warriors and tactics to back it up. Being practical people, they went with what worked. Not reveling in, or particularly liking, bloodshed, their campaigns were designed to minimize it, at least for themselves. Against other armies, they used the same methods as when they hunted game on the steppes back home. Retreating to draw the opposing army onto favorable ground was a common tactic that seems to have worked every time. Against cities, they used Chinese-designed siege engines, re-routed at least one river and, in another siege, when the inhabitants had barricaded themselves within their city walls, built an entire second wall around the perimeter to demonstrate who was really in charge. When the Mongol army arrived at a city, it was given the opportunity to surrender and if it did, then everyone, except leaders who could foment revolt, was pretty much allowed go on peaceably about their business, but under a Mongol administration. Defiance was met with total destruction, hence their reputation for violence and ruthlessness in the West. The boundaries of the empire expanded until they were defeated by the Mameluke army of Egypt in the west, failed twice to conquer Japan in the east and were more or less defeated by the hot, humid climate to the south. Kublai Khan, Chinggis’ grandson, over the course of twenty years, defeated the Sung dynasty of China and founded the Yuan dynasty, which ruled for over 100 years until overthrown by rebels who established the Ming Dynasty. The other parts of the empire more or less faded away over time and the Mongols were assimilated into the local populations. For most Westerners, that’s the end of the story. But as dramatic as it is, it’s what happened during the existence of the Mongol Empire that I found fascinating and which is the heart of this book. The Mongols, over three generations and thirty years, created the largest land empire the world has ever seen. They created countries, Russia is one example, that hadn’t previously existed. Within that empire the Pax Mongolica reigned. It turns out that Chinggis Khan wanted peace for himself and his people. The irony, of course, is that he waged war for most of his life to achieve it. So, how does any of this relate to the modern world? Well, here are a few highlights from the book…..
-Chinggis Khan established the supremacy of the rule of law, which he applied to himself the same as to the poorest herder. It’s known as The Great Law and was based, not on divine revelation or the codes of settled lands, but the customs and traditions of the nomadic steppe people. This at a time, the 13th century, when in Western Europe kings ruled by divine right, no rules need apply. -Given that within his empire, virtually every religion, including Christianity, Islam and Buddhism, was represented, Chinggis Khan decreed total religious freedom for everyone, though he himself worshiped the traditional Mongol spirits and always had a shaman in attendance in his camps. -The Mongols had no written language. Once they found themselves administering an empire that was almost 6000 miles from east to west, that had to change. Since the Uighers are closely related to the Mongols (Xinjiang in China in their homeland) and already had a perfectly serviceable writing system, Chinggis Khan simply adopted it. That, plus the addition of professional administrators from China and other countries like Persia, and bureaucratic paperwork, Mongol-style, was born. -Most Americans have heard of the fabled Pony Express, which operated for a short time in the 19th century American West. The Mongols had the “arrow messengers”, a system of fast riders. The stations were about twenty miles apart and staffed by about twenty-five families. The system survived from the 13th to 18th centuries, when it had sixty-four stations. Chinggis Khan knew that efficient, reliable communication was essential for administering the empire. -Under Khubilai Khan in China (the empire had split into four parts by that time), the Mongols: “guaranteed landowners their property rights, reduced taxes and improved roads and communication”. They reduced by almost half the number of capital offenses that had existed under their predecessors, substituted fines for physical punishment and moved to limit the use of torture (evidence had to be gathered first; physical compulsion was a last resort) at the same time European authorities, both church and state, were expanding it through, among other things, the creation of institutions like the Inquisition, no evidence sought or used. -Khubilai Khan greatly expanded the use of paper money, which Marco Polo remarked on, creating opportunities for both credit and bankruptcy. No one could declare bankruptcy to avoid debts more than twice. A third time could lead to execution. The money was made from mulberry bark, cut into various sized rectangles, marked and stamped. -Unlike the Romans and their enthusiasm for blood sports, the Mongols had a cultural abhorrence, mentioned earlier, of bloodshed. They had no interest in pitting animals against each other for entertainment. Execution of criminals was not a public spectacle as was so prevalent in Europe. -What made Chinggis Khan’s, and his descendant’s, empire tick was trade, on a massive scale. Under the Pax Mongolica, the Silk Road flourished like never before or since. The quantity and quality of goods that flowed between east and west was incredible. A partial list of what the author mentions includes: silk (of course, and in massive amounts), bronze knives, wooden puppets, iron kettles, board games, perfume and makeup, musk, indigo, jewelry, wine, honey, cinnabar and sandalwood. It was the closest thing to a global economy until relatively recently. The author, Jack Weatherford, has produced a compelling, compulsively readable account of how one man, starting from nothing, even being kept a slave for some period of time, rose to become the ruler of the world’s largest empire and, in doing so, laid much of the groundwork for the world we know today. And…. he has a new book coming out on Feb. 16, The Secret History of the Mongol Queens: How the Daughters of Genghis Khan Rescued his Empire. Wasn’t that a fantastic book! I love your painting of the Mongol boys also.